This metal horse sculpture is one you'll really have fun displaying on your wall. The long legged pony is reminiscent of a newborn colt with its gangly, adolescent-like legs and is absolutely adorable. Long legged pony is shown in finishes above (left to right) in blue heat, rust and swirled steel. The metal horse sculpture comes in two sizes: medium (measures 16 x 9) and large (measures 23 x 12). And is available in a variety of finishes, including rust, rustina, patina, black, swirled steel and blue heat. Order one in each finish or in different sizes to make your own metal wall art scene or combine with other pieces in our metal wall art collection. 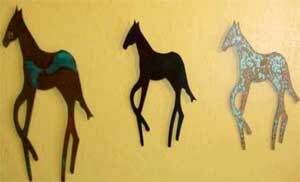 Finishes on metal horses shown above (from left to right) are rustina, black and patina). The metal horse art piece comes ready for hanging and can be displayed inside or on a fence or garden wall. Order to delivery time is approximately four weeks. Order your metal horse art today.